We are a property management company who look after blocks of flats, residential lettings & management & some commercial properties & have used Tucker Glass & Glazing for over 10 years, following them being recommended to us by another long standing contractor. We have always found them to be honest, reliable & trustworthy, supplying competitive prices for all forms of window maintenance, supply & installation, not just double glazing, but servicing of sash windows, leaded lights etc. No job is too small, over the years they have undertaken many small tasks & will always try to source any parts for all types of windows prior to advising that they are not able to repair as the parts are not available. They attend to repairs very speedily & are always courteous in dealing with landlords & tenants alike. Their quotes & invoices contain in depth explanations, which is something that is most helpful to us in our capacity as managing agents on behalf of residents & landlords. We would not hesitate to recommend them to anybody looking for window contractors. I have used Tucker Glass & Glazing several times in the last few years. The windows are outstanding quality & the customer service is first rate. Alf Tucker & his sons are reliable, trustworthy, friendly & helpful. I can highly recommend them. I have known Alf Tucker for 20years. I used Tucker Glazing on a professional basis when working for a Local Authority & found the work was always to a high standard. Tucker Glazing is a family run business & you also get a good personal service. I recommend Tucker Glazing to anyone. 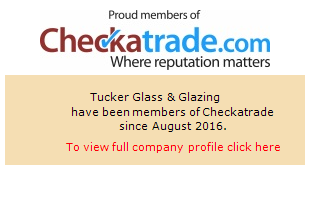 Tucker Glass & Glazing & M G Axton have had a long standing business relationship, over this time they have proven to be a professional organisation & I would not hesitate to recommend their services. Tucker Glass & Glazing came very highly recommended by a long-standing contractor (over 20 years). We have always found Alfie Tucker & his sons helpful & honest, supplying quotes at very competitive prices & diligent in their work. No job is too small & in emergencies, they will always try to attend as soon as possible. The workmanship is professional & sites are left in a very clean & tidy condition.